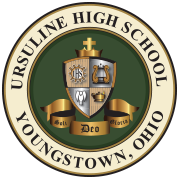 Want to nominate someone for the Ursuline Athletic Hall of Fame? Download this form, and return it to the Alumni Office by October 1, 2017. In the winter of 1975, Principal Tom Carey approached Bob Miller, Ursuline Class of 1939, with the idea of starting an All-Sports Hall of Fame and persuaded him to serve as chairman of a nominating committee. Since this was to be a new venture for Ursuline, research was needed on formats and methods of selection. Bob contacted other high schools, namely the high school in his hometown of DuBois, Pennsylvania as well as Lowellville High School. With their help and suggestions, a set of guidelines was established and the Ursuline Hall of Fame was officially founded on June 24, 1975. In addition to Bob Miller, eight other members were appointed by the Executive Board of the Booster Club to serve as the initial nominating committee. The first athletes were inducted on November 29, 1975 at the Booster Club Thanksgiving Dance at Idora Park. The Hall of Fame was held in the Idora Park Ballroom until 1988 when the induction ceremony was held in conjunction at the annual Nick Johnson Scholarship Dinner. Nick Johnson was a long-time football coach at Ursuline. In the years since he helped Tom Carey found the Hall of Fame, Bob Miller was asked to establish hall of fame programs at other high schools such as Cardinal Mooney, East, Girard, Waterloo, Ohio and Milton Township.